Janice of The Vivienne Files' recent post featuring coral, including synthetic coral earrings, inspired this post. I'm 100% with her on her avoidance of new coral; if anyone tries to sell you new coral that is supposedly "sustainably fished", run, and send them this article from Living Oceans Foundation. But fake coral can look as lifeless as imitation pearls. It is impossible to replicate the layered structure of genuine coral, just as nacre on a pearl cannot be duplicated on a glass bead. 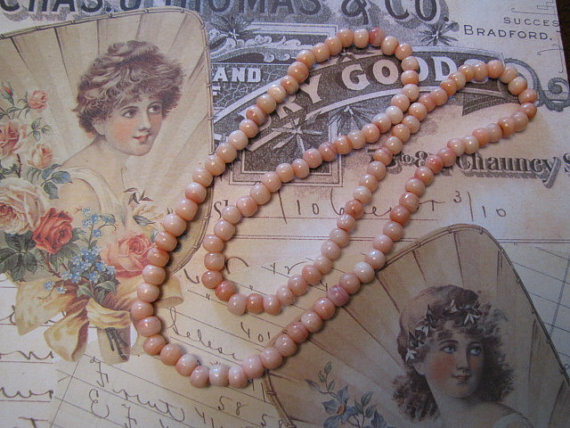 Left, an Edwardian coral bead and pendant necklace set with tiny diamonds. 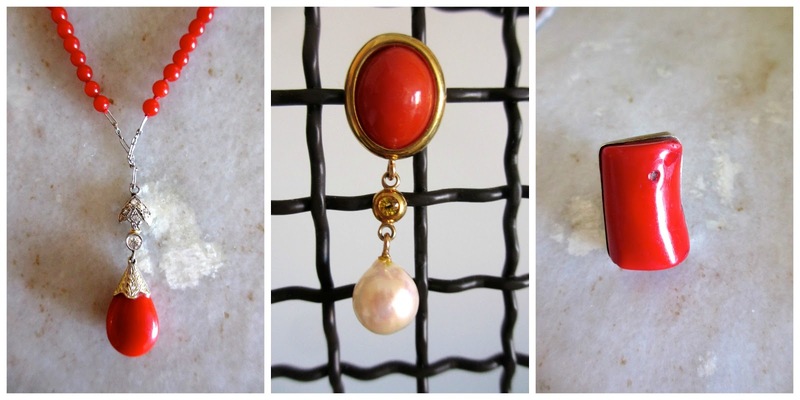 Middle, earrings made by restyling a pair of vintage Italian coral (ca. 1940s) earrings by changing the setting and adding yellow sapphires and baroque pearls. There are two broad quality levels: gem grade and semi-precious (like that big ring of mine), and quite a difference in price. You can find a summary of coral types and quality here. 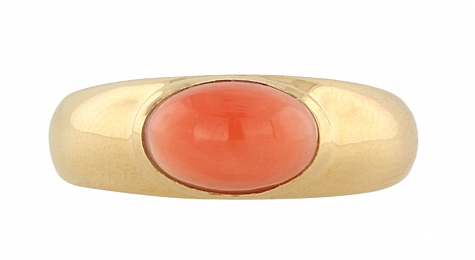 Gem-quality coral is lustrous, hard, and dense, so pieces feel weighty. This Victorian coral and 10k gold ring (price, $650 from Park Avenue Couture) is an example of the price for an antique, unsigned piece. What characer in this ring, which looks as if it might have been worn by Virginia Woolf. You can see the depth of colour and organic nature that distinguishes it from plastic-y artificial materials. Who would want new, compared to this? Semi-precious coral, even if antique, is usually colour-enhanced through dyeing and is stabilized or filled, because it is more porous. 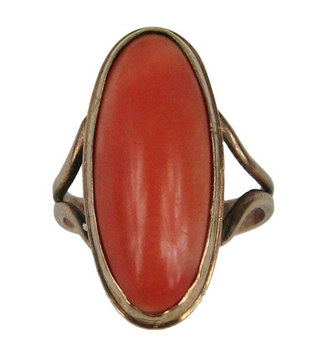 But even with semi-precious, when you buy vintage coral, you should be getting coral. Price is often a signal; you cannot buy an "antique Tibetan necklace" of "genuine coral and silver" for double digits, so that eBay listing at $70 is, I am willing to bet, anything from dyed agate to plastic. One suggested test for real coral (which I have never carried out myself) is to apply a small amount of concentrated lemon juice to the coral (e.g., on the back of an open setting). If the coral is genuine, it will bubble (which you can see with a loupe) and stick to the coral rather than running right off. Remove the lemon juice immediately after the test, using gentle soap. While coral, ivory, some types of horn and other materials taken from endangered species or environments receive close attention and treaty protection, depending on various countries' policies, polluting and inhumane conditions persist in gem and precious metal mines worldwide. Therefore, I recommend buying vintage gems and recycling noble metals. You could forgo such adornments altogether and spend your life in string bracelets and macaroni necklaces, but that is not appealing to many women, me included. Buying consciously or restyling what we have is a liveable compromise. If I were in the market for a new stone, I would seek ethical gem dealers or ask my jeweler to source such material, but as author and filmmaker Greg Valerio points out on his site, the industry is notoriously resistant to regulation, and even the definition of "fair trade" varies from country to country. Scroll to the bottom of his enlightening post to see four companies whom he recommends. Whether it's clothes or food or jewels, we are asking, more and more often, "Where does this come from? At what cost to the environment?" Beauty can co-exist with stewardship, and one way to achieve that is to search for previously-owned treasures. Excellent post - intelligent, beautiful and responsible! Thank you, as always, for sharing your point of view, your information, and your gorgeous jewelry collection. You have such beautiful jewellery and it is so responsible to reuse and restyle. Whether it be stones or fur, you provide some inspiration those of us who want to be environmentally friendly. I really like the earrings. 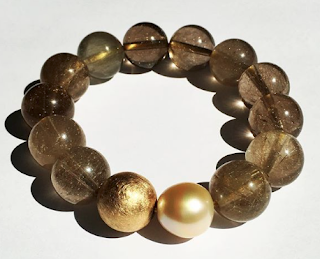 As always, your jewellery posts are educational as well as beautiful. Thanks for the link to the fair trade article. I have a angel colored coral necklace that belonged to my husband's grandmother. (The fact that it was given to me means that no one else wanted it!) The coral beads are very petite in size, but lovely. What a fabulous post! I love coral - both the substance and the color. And pink coral is beautiful too. All in all my favorite color. I'd like to point out that vintage lucite or the vintage French plastics in coral can be quite beautiful. 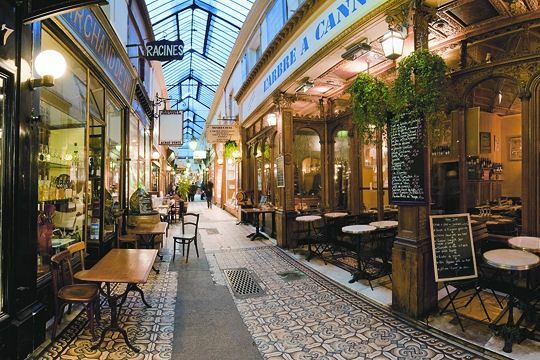 They are not inexpensive, and sometimes hard to find (unless one happens to find oneself in a Paris flea market). Nonetheless, the make very pretty baubles, although not rings that I have seen. I found a beautiful necklace of graduated coral colored vintage plastic beads from the 40s on eBay and it makes me really happy!! Coral is just beautiful and I am grateful for your coral-conscious post. Thank you for another useful (and beautiful!) post. I have been looking at coral pieces online for several months, but just didn't know enough about it to feel comfortable about buying. It sounded iffy even to me that coral could be "sustainably harvested". Claire R.: The older plastics are often more effective imitations than the new, and the design of the piece can elevate them. And as a general principle, I find the authentic material more satisfying; there is an essence in natural materials that is missed, sometimes just narrowly, in synthetics. And i do enjoy plastic that is being what it is- plastic- such as the pieces by Sobral, on which I have posted. Cathy: It's amazing (and disturbing) what some vendors will claim. But vintage coral is still plentiful and decently priced, especially for unsigned pieces. Susan: ..."that no one else wanted"... (fans self). How lucky for you, it must be beautiful with your blonde hair. I have a coral necklace that looks like a bunch of twigs strung together. I bought it at an antique store, but I don't know how old it is, or if it is old at all. Should I be worried about its history? 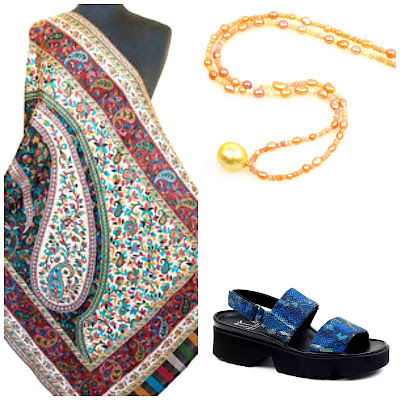 I would wear and enjoy it; you bought it in good faith. I agree. Lovely post; lovely examples. Thank you. I have been given a beautiful black coral necklace. I sure wish I knew more about black coral. It is unique with long dagger type pieces. I don't wear it much as it looks rather Goth and am thinking of having it restyled. Are you familiar with black coral? Though black coral is endangered you can easily find it for sale in shops in locations such as Mexico and Belize, and offered by street vendors elsewhere. Sometimes it is real, sometimes fake. Restlying is an entirely different question.